For those who are experienced or who are wanting to develop their beginner skills, MMCC has a variety of informal training groups, which can cater for all members from beginners through to advanced paddlers. Social groups can be found leaving from the Noreuil Clubhouse on Mondays, Wednesdays, Fridays from 4.30pm onwards as well as Saturday mornings at 6.30am. These groups paddle TK1s, TK2s and K1s. 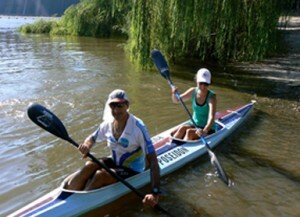 It’s a great opportunity to meet and paddle with other members of the club in a relaxed, friendly way. 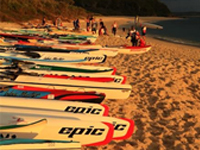 Specially organised social paddles occur around the year and are communicated to members via the MMCC Facebook page. During summer, graded club races are held at the Gateway Lake every fortnight on Wednesday evenings. Contact Russell Wood for dates and details. In the summer months a Monday 5.00pm TK2 paddle group can be found leaving the Noreiul clubhouse. This group comprises both experienced and inexperienced paddlers matched up together for a 1.5hr to 2hr paddle wandering the Murray and creek offshoots. This paddle is aimed to provide further skill training development and build longer endurance with the guidance of an experienced paddler. It is advised that paddlers joining this group have completed the beginner group training plus have a sound base fitness. Paddlers who are wanting to take their kayaking to the next level can find a more advanced formal group paddling onwards from 4.00pm every Wednesday and Friday at the Gateway Lake Venue. Each winter when it’s just that little bit harder to get out of a warm bed and go paddling the MMCC holds an individual winter time trial series to help keep you motivated in the dreary winter months. Every second Sunday Winter ‘die hards’ can be found at 3.00pm paddling 3 timed laps (6km) around the parkland lake trying to improve upon their previous times. They warm up after with an afternoon tea and sometimes a bbq but always with a lot of playful banter. Paddlers of any level are encouraged and welcome to come and join in. It’s not how fast you go but if you beat your last time! 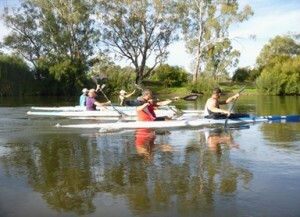 Several club members enjoy group paddles in sea kayaks and surf skis on the expansive open waters of the Hume Weir as well as overnight downriver tours. There are no fixed regular paddles of this nature but come along to the Club and meet up with people with similar interests.